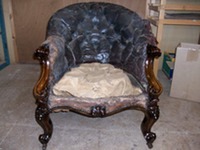 Timber Restorations provide a full re-upholstery service to its customers, whether it be modern or antique we can bring life back to your furniture. 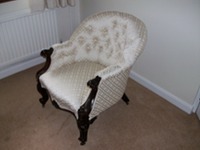 In these times of growing costs re-upholstery is a very cost effective option to buying new. 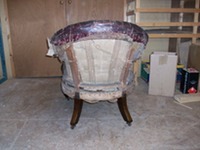 Re-upholstery also allows you to choose the exact fabric and colorway to compliment your existing home decor. We have a extensive range of both fabric and leather swatches from some of the best suppliers, giving you a vast choice. You can also supply your own material if you so wish. We only use the best possible materials and fillings which adds to our guarantee of quality and peace of mind. 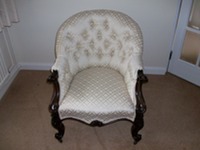 Our high level of workmanship and attention to detail guarantees a quality finish whether simply recovering the top fabric or undertaking a complete re-upholstery. 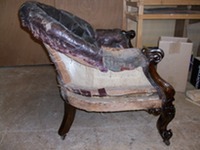 We are able to completely restore antique pieces from the frame up including any repairs to the frame, replacement springs and webbing, right through to re-french polishing the frame to bring it back to its original state.